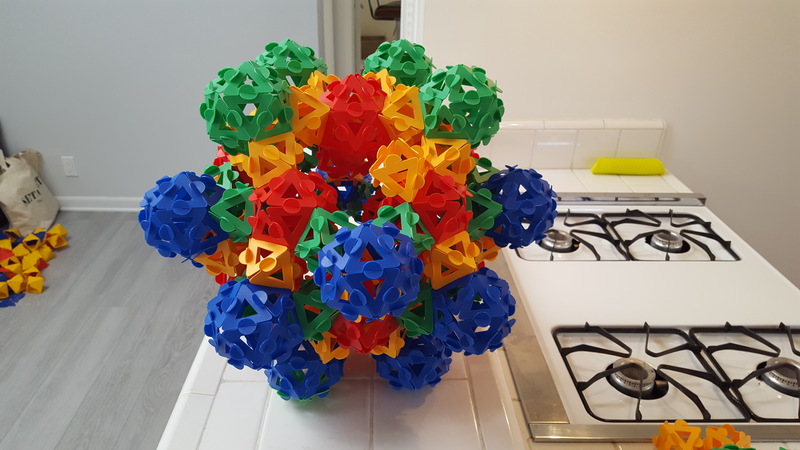 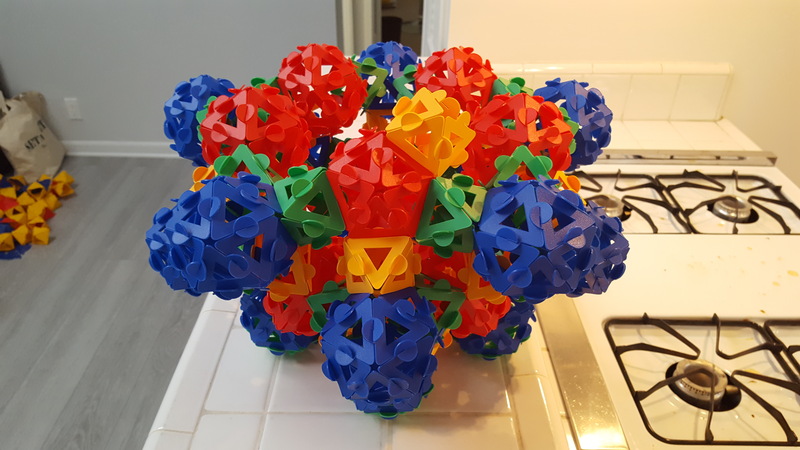 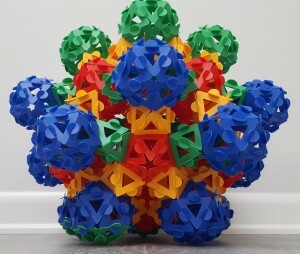 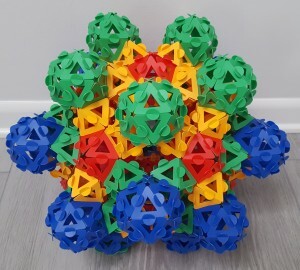 The next stop on the quest to build an excavated dodecahedron out of 32 icosahedra and 60 octahedra joined face-to-face was a product called Itsphun. 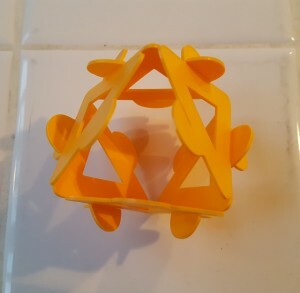 This toy consists of plastic polygons that have a slitted tab in the middle of each edge. 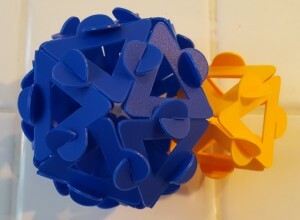 You can interlock the slits on two polygons to connect them edge-to-edge. 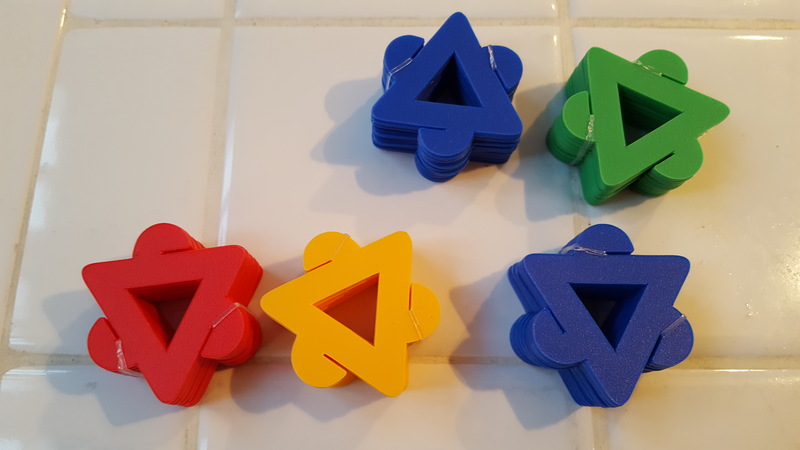 This usually leaves the tabs sticking out, and the pieces do have their centers cut out, so you don’t get the sleek look of Polypuzzles or Polydron. 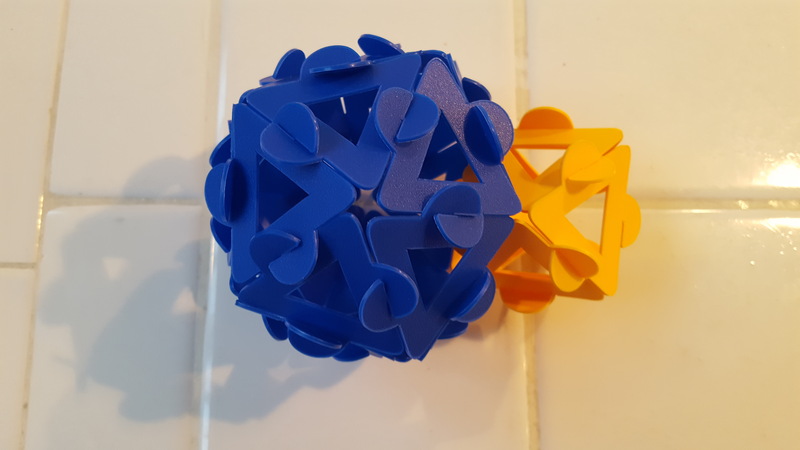 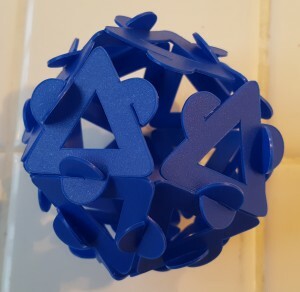 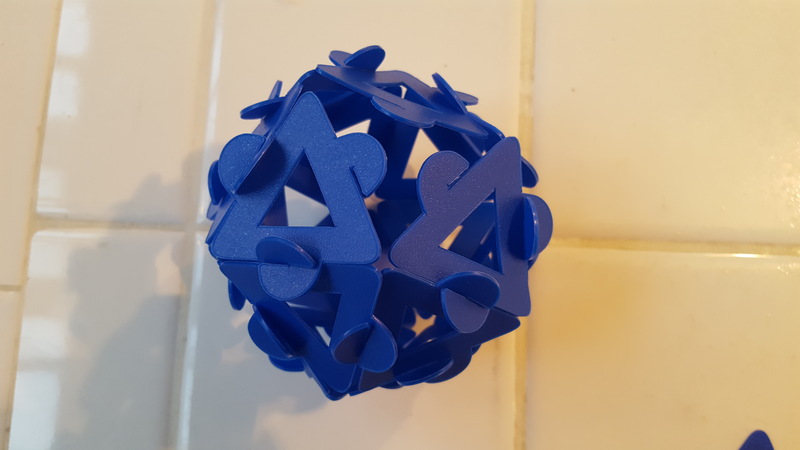 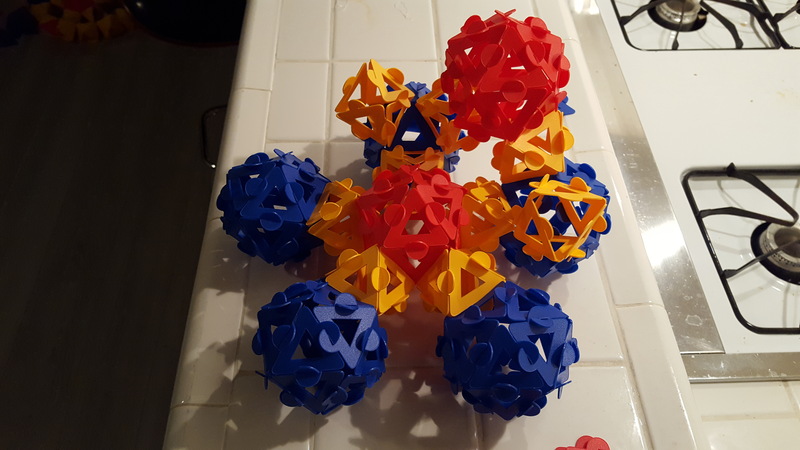 But they go together very quickly, and you can easily connect a pre-made octahedral connector with an icosahedron missing one face to assemble the components. 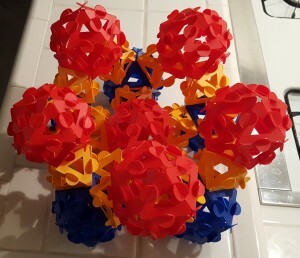 So Itsphun seemed like a promising material for this construction. 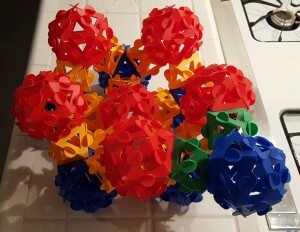 As before, I started with one of the pentagonal faces of the eventulal dodecahedron; only this time, since it was sufficiently easy to take faces out as well as put them in, I just made the structure with complete icosahedra at what would become the vertices, and then removed the proper faces and plugged in pre-made octahedral connectors. 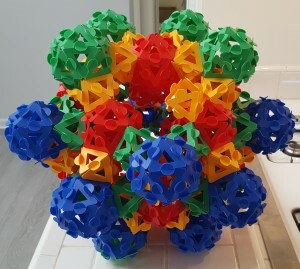 The same procedure worked for the face-central icosahedra in the first tier above the bottom. 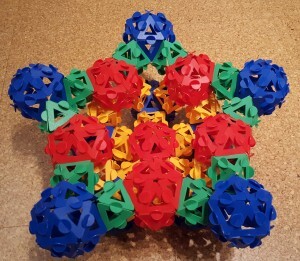 It was pretty easy to complete all five of the face-central icosahedra in that tier. 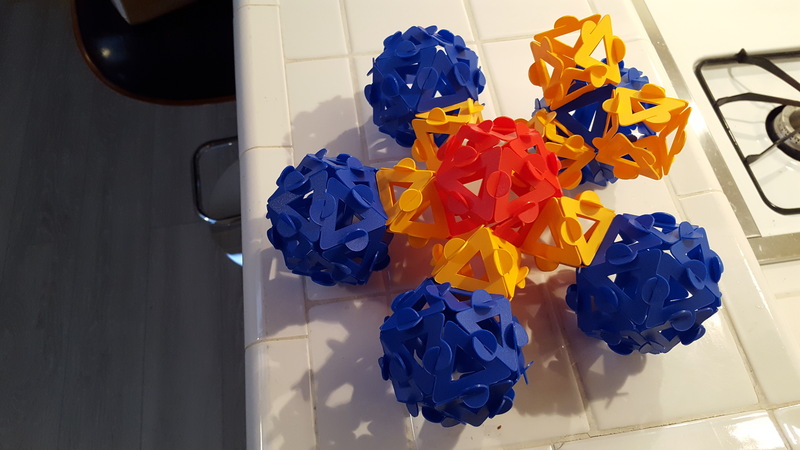 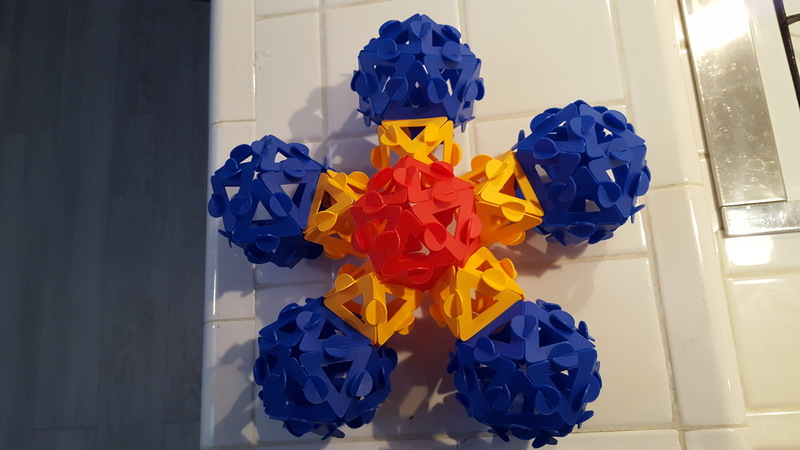 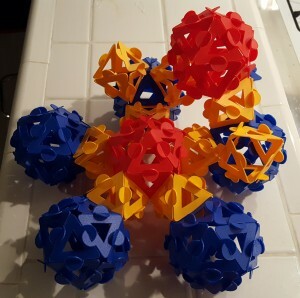 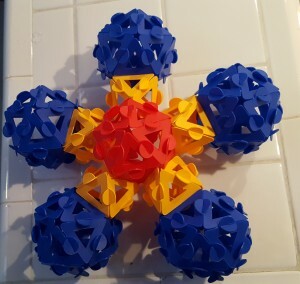 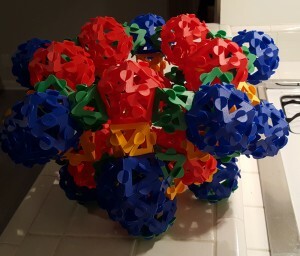 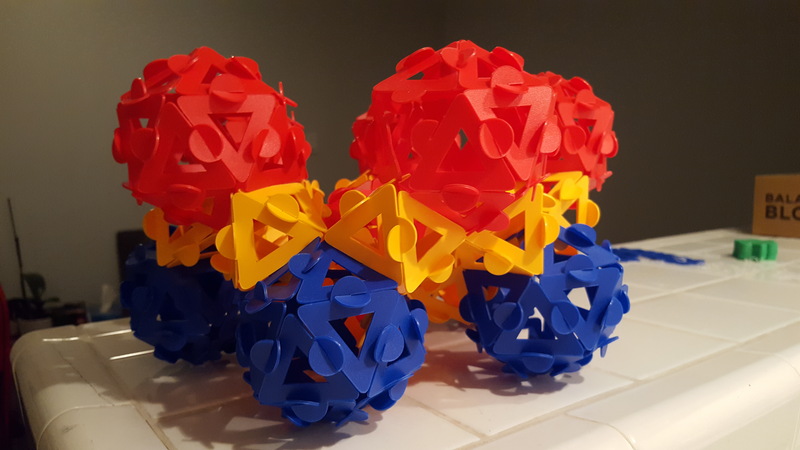 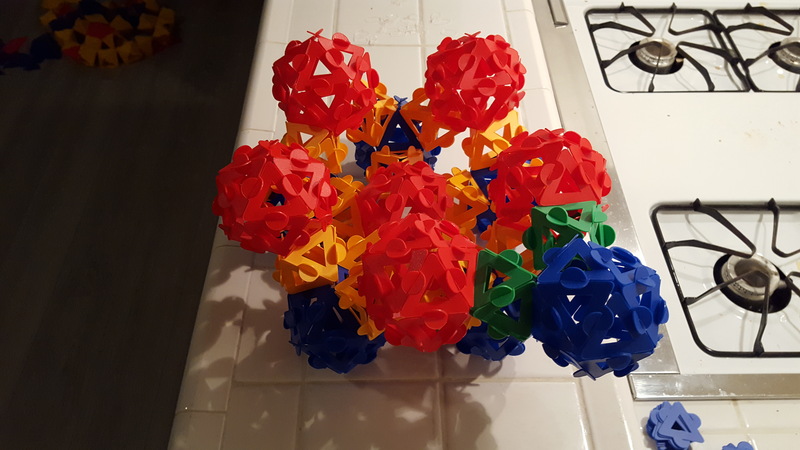 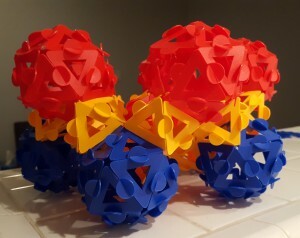 Now it was time to connect those five-way hubs with what would become more vertex icosahedra. 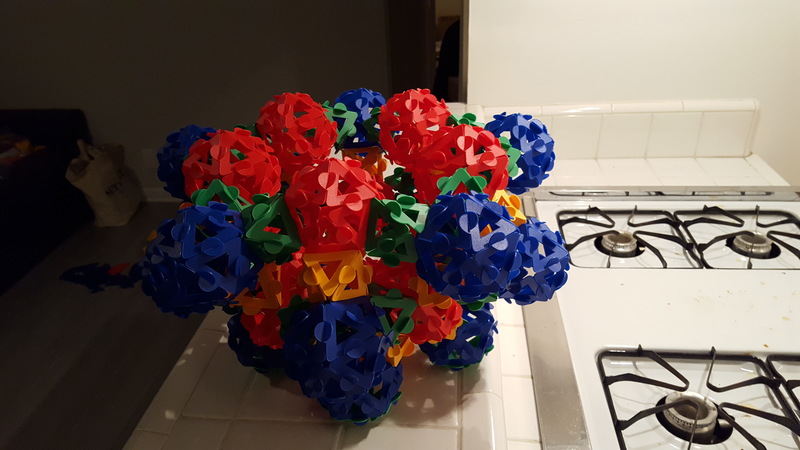 Here’s the entire first tier of the structure. 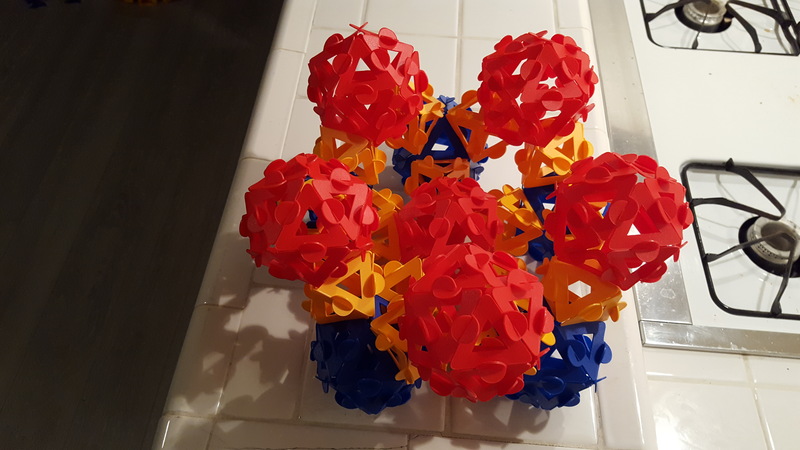 The central icosahedra of the second tier went on similarly, and then the next day I started making connections for the top tier of vertex icosahedra. 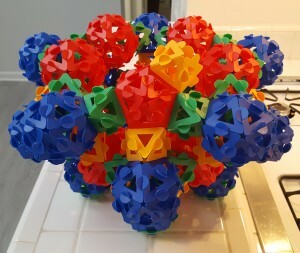 And here’s the completed excavated dodecahedron. 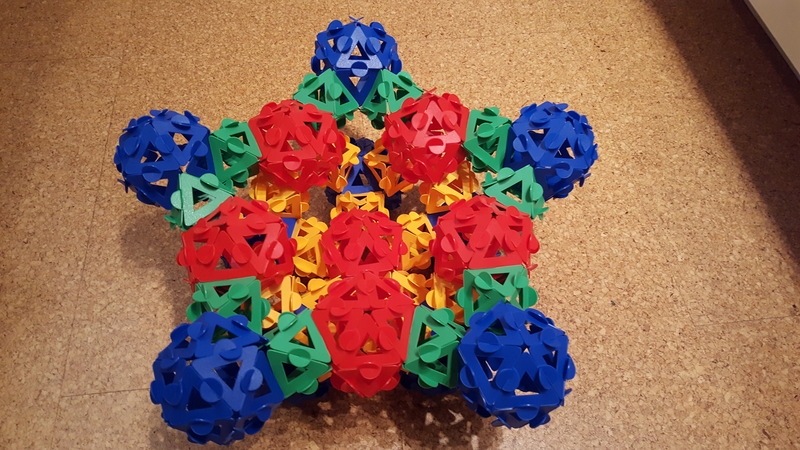 Itsphun couldn’t be beat for quickly and easily assembling this large, complex structure. 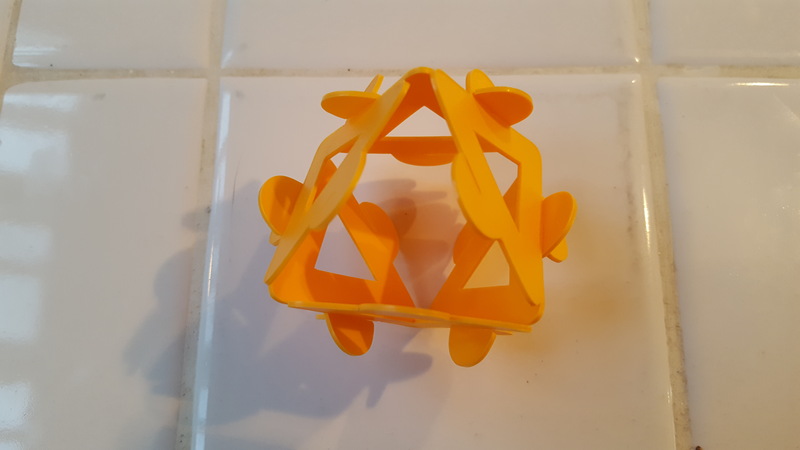 One drawback that occasionally came up is that while the slits slide together easily, they can also at times slide apart easily, so some components of the structure would fall apart at times, necessitating going back and re-doing some connections that had already been made. 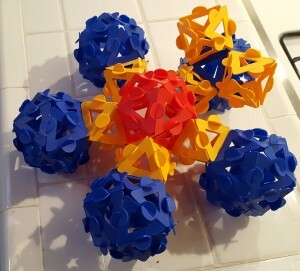 But overall the forward progress was steady, and the final structure very satisfying, if a little busy with the tabs. 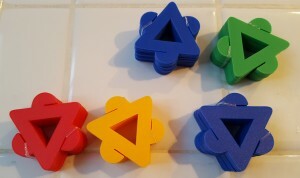 Next time, we’ll find out where all this triangle activity was leading.